They actually put the Christmas tablecloth on this year! Yesterday, I mentioned on Facebook that I had tried something new. I usually beg at the human’s table but rarely show an innerest in what they’re eating cos it rarely contains meat or anything I like. For Christmas Eve, Pop decided on the spur of the moment to make a Salmon Loaf. After it came out of the oven, TW gave me a small piece and I walked away in disgust. I thought they were having something nommy like Chinese food. Have I mentioned that I LOVE Chinese food but TW doesn’t want to give me any. It seems Maxwell, Faraday and Allie’s Mom wrote an article about cats and onion and since then I haven’t been permitted any of my favorite foods. Back to yesterday. TW was having some of the leftover salmon loaf in a sammich and I hopped on the table. She broke off a piece and placed it in front of me. I walked away so she cut it smaller. I ate it. I was hooked. I begged and pleaded for more. She mentioned I couldn’t like it that much cos I wasn’t purring. OK, I even started purring. She did her part and kept the tiny pieces coming. For those afraid that I got too much human food, it was barely a corner of the slice. Some of you were axing for the recipe. The peeps don’t have many recipes cos they can’t cook. MOL! This is your lucky day cos I’m gonna let you in on the top secret recipe and I won’t even have to kill you. HAH! I typed it on the ipawd so you can click and drag it. If you want to make it the way we do, Pop doubles the recipe so there are leftovers. We also use the juice of real lemons and real parsley but we use fake butter. Go figure. You can substitute lemon juice, parsley flakes and real butter. We didn’t have parsley in the house so we made it without. I didn’t mind but TW likes parsley. So there you have it; one of the recipes that make Le Chez Keisha a Five Star Restaurant. Any of you guys wanna order some salmon? Oh look, it’s almost MIDNIGHT! That sounds very, very yummy! Mmmm, that recipe sounds good! I hope I can get my human to try it - and she doesn't put onions in it, like she likes to do with everything! That salmon sounds delishus! Happy Mew Year! Mom says the recipe sounds really good. I don't like salmon, though. Mom says thanks for the recipe. Hey, we like salmon, so if you got any left over....... We're sorry about the Chinese food. Next time we're noming on some, we're gonna feel a little guilty now. Sorry. That recipe looks simple enough for even our human, who also doesn't cook except when she absolutely has to. (She'd rather scrub litter boxes, frankly.) We're glad you enjoyed your salmon treat! A very happy new year to; may 2015 be healthy, happy and safe! Ohhhh salmon loaf. Yummy! It must taste really great to make you purr :-) Thank you for sharing the recipe, it looks easy and simple - which is the best! Enjoy your new year's eve. I wonder who you are gonna kiss in the midnight :-) And we wish you a very happy New Year!! That sounds so yummy! We are trying to talk Mom into making it. That sounds yummy! You know, when we get grilled chicken, neither Newton or Pierre will eat it the day it's cooked (Ashton has no problem with that, though!). They will eat it the day after. It sounds like you and salmon loaf are the same way. Happy new year to you, TW, and Pop! Sounds like yum n' fun CK! Happy New Year stunning one! Uck, I am not a fan of fish!!! BOL! I wish you a very Happy New Year!!!!! HAPPY NEW YEAR, CK!!! We love you! Y'know, CK? 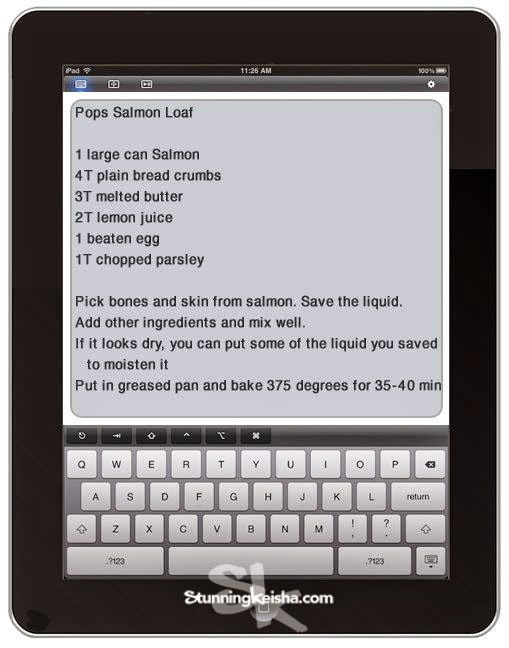 Our peeps don't like salmon very much but we're gonna ask the mom to make this just for us! Happy New Year's Eve! Sounds really jummy , CK ! 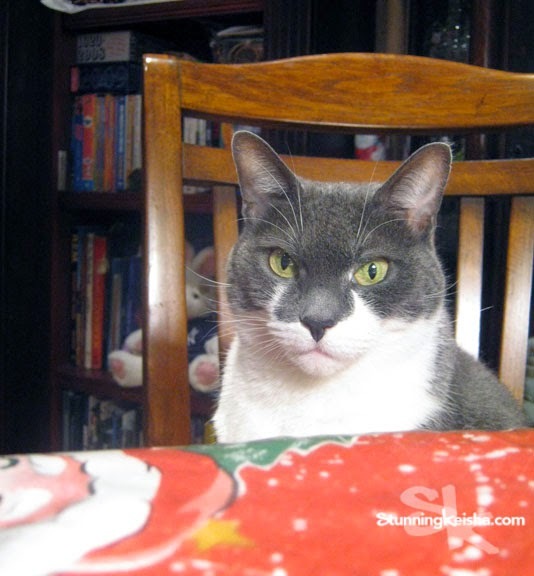 Is there any leftovers left to me ? 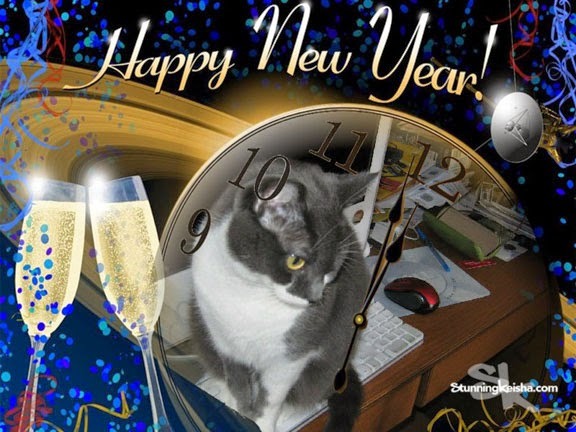 Wish you and your humans a Happy New Year ! Our moms is going away for the weekend, but she said she would make some for Dad and us to eat while she was gone! Thanks for sharing the recipe and have a Stunning New Year! I am sure it was your visit that started me feeling better, and of course sleeping with your fur next to my heart. I am hoping to eat enough to get my mancatly fizz-eek back so you can feel proud of me. Catnip in place of the parsley would be great- for you, not so much the peeps :) Thanks for the recipe. Hope you have a happy and healthy new year! Have a Happy and Healthy New Year!!! Oh, and I will be trying that recipe sometime this week. I have a few critters 2 and four legged that love salmon. Mmmm, salmon.... salmon salmon salmon, and salmon salmon. And salmon too! 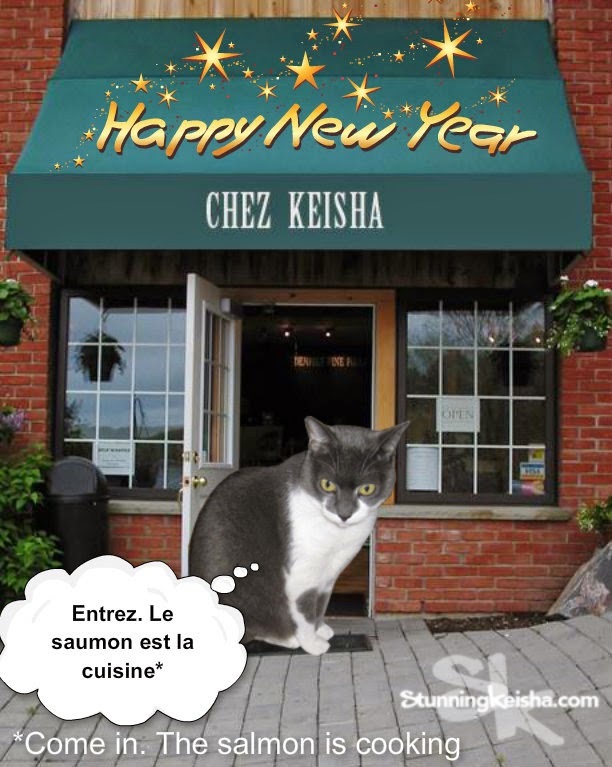 Have a salmon and Happy New Year! MOL! Wow CK that salmon stuff sounds pretty good! So we're winding down the old year and about to start the new one. You almost had to wait until the year was over to discover you love salmon loaf - who knows what you'll discover in the coming year! HAPPY NEW YEAR CK..........thanks for brightening my days. That sounds like a great recipe. I don't do a lot of cooking either - I'm a horrible cook. Somehow I can bake pretty good cookies though. Go figure. I hope that you have a wonderful New Year!